On February 15, the Seattle School Board unanimously passed a resolution affirming the Board’s commitment to protecting the safety of all of the District’s 53,000 students, irrespective of race, religion, gender identity or immigration status. The Seattle School District refuses to be party to the destructive and inhumane politics of fear fomented by Donald Trump, whose orders call for extreme actions against immigrants, and violate the founding principles and spirit of this nation. The resolution parallels recent declarations of cities across the nation, including Seattle, Los Angeles, San Francisco, New York and Washington D.C., reaffirming their status as sanctuary cities. February also marked the 75th anniversary of Executive Order 6099, President Franklin Roosevelt’s shameful 1942 decree that resulted in the rounding up and internment of over 110,000 Japanese-American citizens. A lot of directors and Superintendent Nyland have been very eloquent in their reference to the mood of this nation right now in light of the changing of the guard at the national level, and some executive orders that have come down that have really tested the mettle, morals and principles of this nation. We are a nation of of immigrants. A lot of us have such ties and have history and some of those ties are quite new. My own family on both sides come from immigrant families; I also have connections to Jewish family. So what is happening within the nation right now is something that definitely resonates. And we are aware that this is having an impact within our own District. Our own District is a in a way a microcosm of the nation. We have 149 countries of origin represented in Seattle Public schools and 143 language and dialects are spoken by our students. We as a District are committed to the education and safety of all of our students. We are going to discuss a resolution that will address this. This has been done throughout the national already. School Boards in Los Angeles, Oakland Cal, Denver, Minneapolis, Santa Fe, New Mexico, and El Paso, Portland, Oregon as well have all passed resolutions saying to the effect that have established safe zones within their schools, they will not allow immigration officials to come and take the children away, and we are planning to create a resolution that says something similar. I want to remind all of our children and all our families that they have 5th and 14th Amendment rights that protect them, and we will honor those rights. This also brings to light the fact that education is so important, that history is so important. And it seems that people forget history. And it’s really frightening to see humanity make the same sort of mistakes that it’s made in the past. And so I’m going to conclude with a poem that I would assume everybody has heard before, but at this point I no longer assume that people have heard things before or remember. We are here, and we will speak out for all the students of Seattle Public Schools. 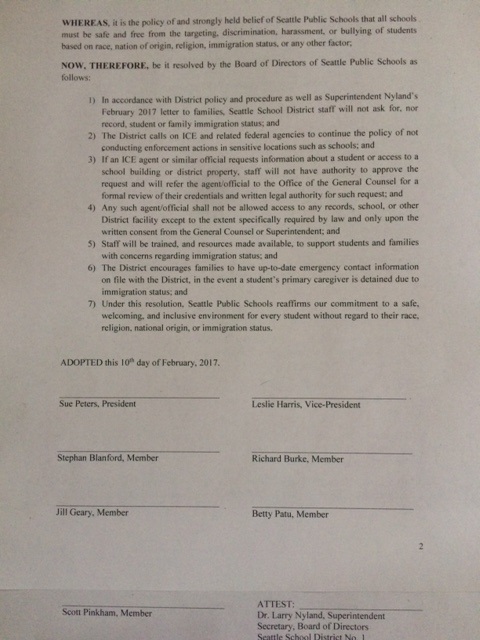 A RESOLUTION of the Board of Directors of Seattle School District No. 1, King County, Seattle, Washington affirming the provision of safe, welcoming, and inclusive schools for all students without regard to race, religion, national origin, or immigration status. 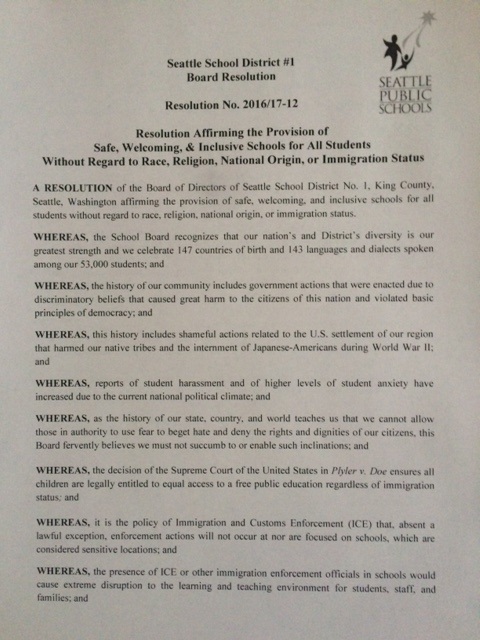 7) Under this resolution, Seattle Public Schools reaffirms our commitment to a safe, welcoming, and inclusive environment for every student without regard to their race, religion, national origin, or immigration status. ADOPTED this 15th day of February, 2017.